Bisanz antique woodcut Besançon France Sebastian Münster 1628. 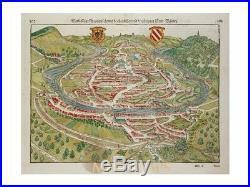 Description: Besançon Old 16th-century antique woodcut in birds-eye view of the city (Bisanz) and surrounding area by Sebastian Munster. The Cosmographia was published in 46 editions. In German between 1544 and 1628, in Latin between 1550 and 1559, in Italian in 1558 and in French in 1575. Authentic Antique Old Maps & Prints from the past See our historic maps of the Centuries of the World continents. 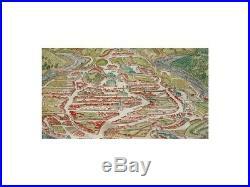 16th -17th -18th-19th Century maps & atlases & prints. 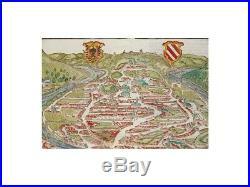 We sell guaranteed Absolutely Original authentic Maps and Prints. 43 x 35 cm. 17 x 13.75 inches. 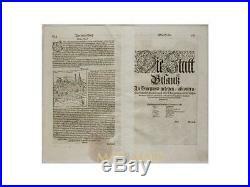 Condition : View overall very good, fold as published, text Old German. 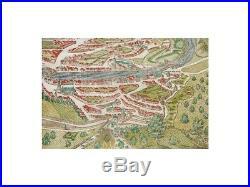 All maps and prints are genuine, authentic, published at the date stated in this listing! Mapandmaps that’s it. 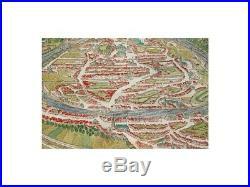 Always real antique maps – Always original – Never reproductions. For better quality pictures please go to our web site. 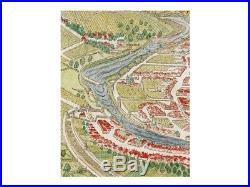 All maps and prints are genuine, authentic, published at the date stated above. 3 day’s Global Express Courier Services on request. The item “Bisanz antique woodcut Besançon France Münster 1628″ is in sale since Wednesday, January 23, 2019. This item is in the category “Antiques\Maps, Atlases & Globes\Europe Maps”. The seller is “mapandmaps” and is located in Europe. This item can be shipped worldwide. Cartographer/Publisher: See the description of the map.